Search for the best flight prices from Stansted to Milan. Compare prices, book today and save money with Stansted Airport. As one of the undisputed European capitals of style Milan has never been short of visitors, but the beauty of this great Italian city goes beyond designer labels. By far the most sophisticated of Italian cities, Milan has a seemingly endless selection of breath-taking architectural and cultural attractions, as well as some of the most luxurious five-star accommodation in the world. It goes without saying that the selection of boutique stores and cutting edge designer brands available throughout the city is simply unbeatable. Milan’s esteemed reputation as the fashion capital of Italy, in addition to its status as a regular trade fair host, contributes to a rich selection when it comes to accommodation. Enjoy the views at the luxuriously futuristic five-star Boscolo Exedra Milano (Corso Matteotti 4-6), while traditionalists will appreciate the elegance of the fashion district’s Park Hyatt Milano (Via Tommaso Grossi 1). Another somewhat old-fashioned choice is the Hotel Cervo (Piazzale Principessa Clotilde 10), which is a decent option offering close proximity to the train station. Meanwhile, there’s a wide array of B&Bs, guesthouses and small hotels, with the Hotel Fenice (Corso Buenos Aires 2) a simple yet effective establishment close to the metro. 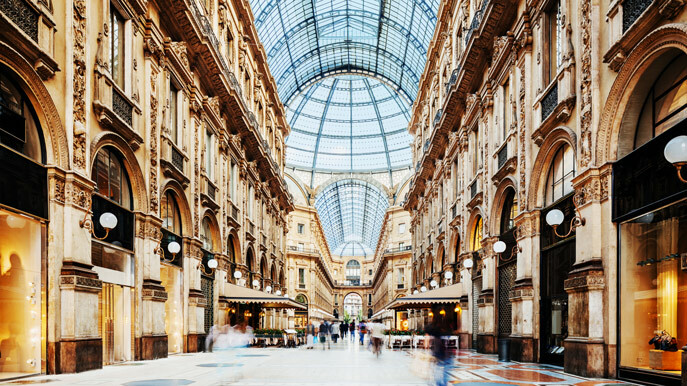 Milan’s shopping culture ought to need no introduction. It is one of the world’s premier spots for designer labels, and boasts a huge array of upmarket boutiques and fashion outlets, in addition to top-quality homeware shops. The central area of Quadrilatero d’Oro, or ‘rectangle of gold’, conveniently plays host to a high volume of the city’s renowned designer outlets, while the iconic Galleria Vittorio Emanuele II is one of the world’s oldest shopping malls, with Prada boasting a presence here since 1913. Get in amongst the locals at recommended outlets such as 10 Corso Como (Corso Como 10) and II Salvagente Milano (Via F.lli Bronzetti 16). Regarded as the most sophisticated city in Italy, Milan’s restaurant scene quite naturally offers the possibility to dine out in real style. There are plenty of high-end joints to be found around the Duomo, but it’s not necessary to break the bank to eat well, with the canal district offering many excellent mid-range options such as Osteria delle Vigne (Ripa di Porta Ticinese 61). The imposing deli-restaurant Peck (Via Spadari 9) is one of the city’s most well-known eateries, while similarly popular is the Milanese penchant for aperitivo, which sees a small extra charge paid for an unlimited supply of light buffet snacks that accompany drinks in the early evening, typically between 6-9pm. Milanese carnival celebrations last for four more days than anywhere else in the country. A highlight of the festivities is the huge procession that makes its way to the Duomo, with children getting dressed up in brightly coloured outfits and throwing paper confetti, or coriandoli. The world of fashion descends on Milan every February as in the region of 100 designers showcase their latest trends. Shows are invitation-only, and parties pervade the city in celebration. Milan’s city centre is shut down as both international and local runners take to the streets to complete either a half-marathon or the Stramilano route, which is some 15km long. The first half of June sees a vast array of street performances, concerts, arts and crafts stalls and plenty more take over the streets surrounding the Navigli canal, culminating in a torch lit procession. ‘Oh so nice! Oh so nice!’ is the Milanese translation of this event’s name, which marks the opening of La Scala’s opera season, in addition to celebrating the city’s patron saint, Sant’Ambrogio, through a series of processions, events and Christmas markets.